A vision board can give you that extra push to help you accomplice your goals and dreams for 2018. A vision board is a board where you can add all you wishes, dreams and goals for this year on. This is the most of the time a collage made on a thick piece of carton or on a canvas. Place your vision board on a place where you can see it each day. This way you’re going to unknowingly do much more to make your wish or dreams come true! It really works! And who knows that during your creative time you come till the knowledge you got more ambition or wishes. A vision board is not hard to make and it doesn’t take that much time. But it does help you to push you more to make your dreams come true. So what are you waiting for? 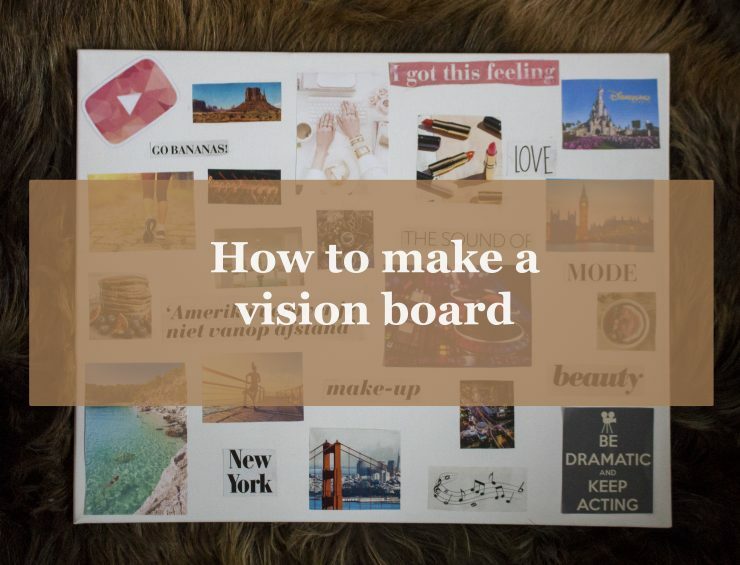 Let’s start with making or vision board! Think about your dreams and goals that you have for 2018. For the most goals you have to be realistic but for the other you can dream as big as you can! 😉 Give your board a theme that you what. With that I mean if you want more structure in your life than process this in your board. Then your board will look much clearer. You can also keep a color theme in mind that you want so lighter or darker colors. The choice is up to you. Start with looking after inspiring photos, text and words in magazine that fits perfectly with your goals. Cut these out. If you don’t find all your goals or wishes in a magazine you can also look for photos on the internet and use these. When everything is cut out, it’s time to lay everything as you want. Then you already can see how it will look at the end. And if you aren’t happy with the result you can always change it. But if you are satisfied with the result? Then it’s time to glue everything together. Late this dry and your vision board for 2018 is ready! How good is lady speed stick? Wat super gaaf in elkaar gezet! Ik denk dat ik er ook een ga maken samen met mijn kids, ben wel benieuwd hoe hun vision board eruit zal zien. Tof idee! Ooh, zo leuk! Je kids zullen dit echt wel leuk vinden! Leuk idee! Het geeft je toch soms even die reminder! Erg leuk gedaan.